Designed for extra long life and performance, there are 102 different variations of the Pearl Abrasive belts available. 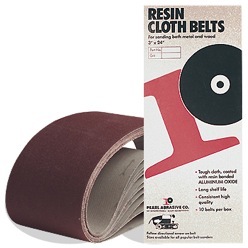 These belts are ideal for ferrous metals, iron, steel, wood, fiberglass, and plastic applications. Please call with the length, width, and grit of the belt you need for pricing and availability.